For reading file i have used below article. After reading record passed the rows to WebMethod using jQuery Ajax and converted the rows to DataTable. Then using the SqlBulkCopy from the below article, write the DataTable to Database. //Read the Excel File data. //Fetch the name of First Sheet. //Read all rows from First Sheet into an JSON array. //For Browsers other than IE. 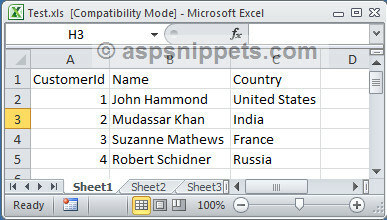 // Save excel data to database. //Set the database table name.